The hyoid, a horseshoe-shaped bone situated in the anterior of the neck, between chin and thyroid, aids tongue movement and swallowing. The hyoid bone is a horseshoe shaped bone found in the neck. It functions to protect the essophagus and facilitates a wide range of movements involved in speaking and swallowing. The hyoid bone is only distantly articulated to other bones by muscles or ligaments. 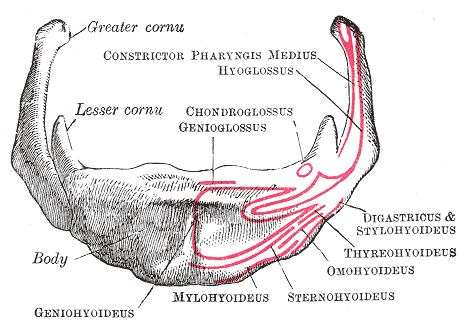 The hyoid consists of a central part called the body, and two pairs of cornua: the greater cornu and the lesser cornu. Ossification begins in the greater cornua toward the end of fetal life, in the hyoid body shortly afterward, and in the lesser cornua during the first or second year after birth. hyoid bone: A bone in the neck which protects the esophagus and facillitates a wide range of muscle movements required for speaking and swallowing. The hyoid bone is a horseshoe shaped bone found in the neck. Located anteriorly between the mandible and the thyroid cartilage, the hyoid bone protects the esophagus and also facilitates the wide range of muscle activity required for speaking and swallowing. It is visible upon extension of the neck. 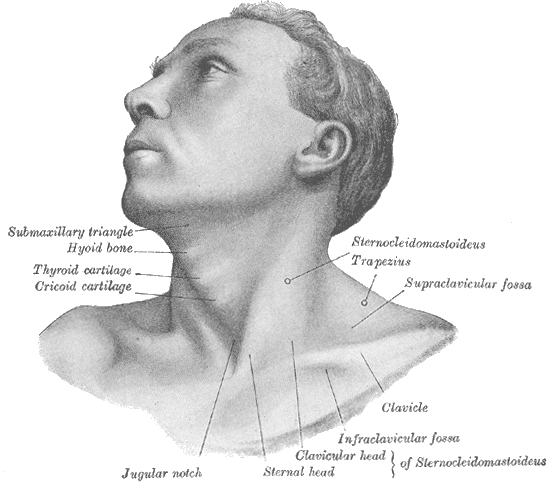 Position of the hyoid bone in the neck: This image shows where the hyoid bone is located. Hyoid Bone: Anterior view of hyoid bone with sections labeled. The hyoid bone consists of a central body and two pairs of cornua, or horns, termed greater and lesser cornua. The greater horns project backwards from the body and provide a platform for key muscles and ligaments to attach to including the stylohyoid and throhyoid muscles. The lesser horns are two smaller eminences which project superiorly to the join between the greater cornua and body and are attached to the body by fibrous tissue. As with the greater cornua the lesser cornua provide a platform for muscle and ligament attachment specifically for the stylohyoid ligament. The hyoid ossifies towards the end of fetal development, commencing in the greater cornua before completing in the body shortly after birth. The greater cornua and body are initially connected by fibrous material although this ossifies towards middle age.